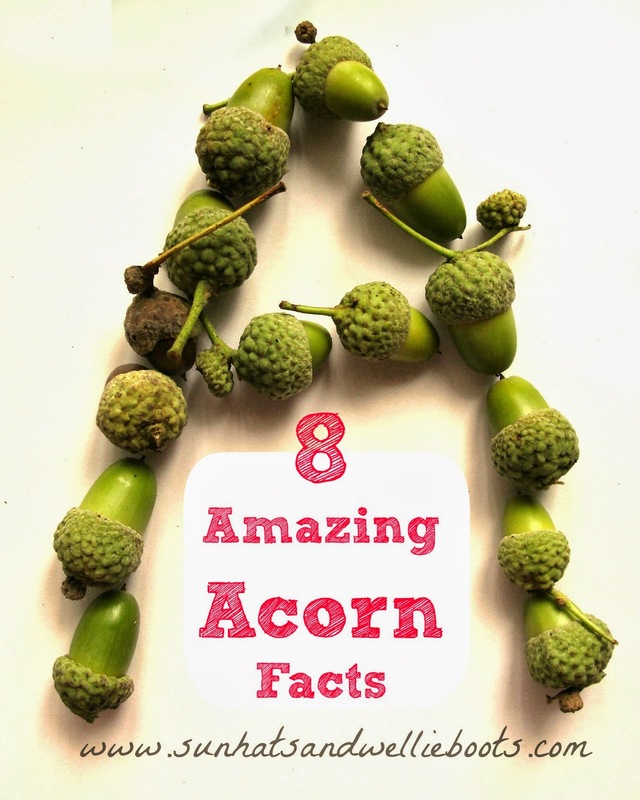 Sun Hats & Wellie Boots: How the Oak Tree got into the Acorn - Plus 8 Amazing Acorn Facts! 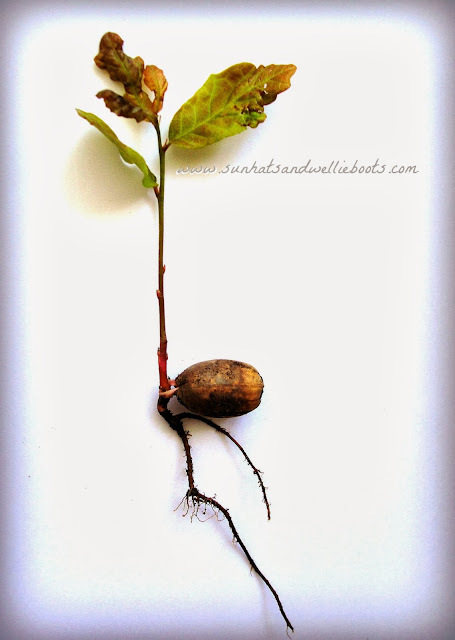 How the Oak Tree got into the Acorn - Plus 8 Amazing Acorn Facts! While gardening at the weekend I found this! It caused much excitement in our house as my little botanist has been collecting acorns for her nature table. How fantastic to see how a giant oak tree starts its epic journey from a tiny acorn! It's been wonderful for her to study this seedling & observe the whole structure of the plant from roots to leaves, & to think about what happens to the plant above & below the ground. 1. Acorns germinate best when away from their parent tree (as there is more sunlight) & it's thanks to birds, squirrels & other rodents who disperse the acorns away from the mother tree that they have a chance to sprout. 2. 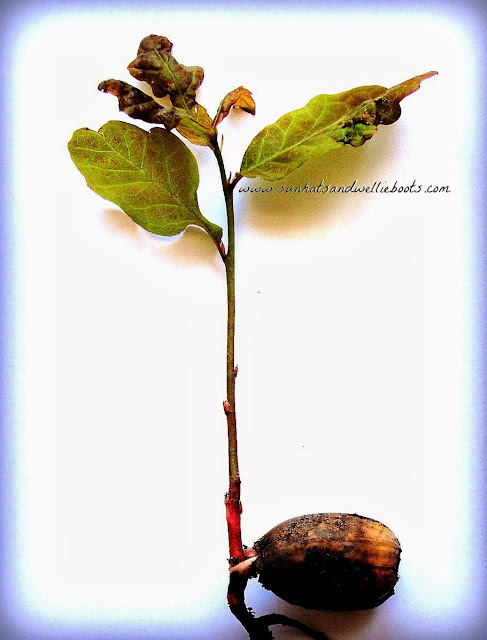 When the acorn begins to germinate it grows a main root called a 'tap root' which pushes deep down into the soil. As this grows it produces a shoot which grows upwards & this becomes the seedling. 3. If the seedling is left to grow it will develop into a sapling after 4-5 years. 4. The sapling then grows into a tree, & after 40 years it produces its own acorns. 5. Oak trees can live for hundreds of years. 6. English Oak trees can grow up to 400 feet tall! "Mighty oaks from little acorns grow"
7. Acorns are important for wildlife. Jays, pigeons, woodpeckers, small mammals, squirrels & rodents eat them as the main part of their diet. 8. Oak is a type of deciduous tree (losing its leaves in the Autumn) & is related to the Beech tree family. If you're looking for a book which explores the journey from acorn to oak in more detail this is a great introduction for kids. I love how our initial find sparked so much discovery into acorns. The awesome power of nature never ceases to amaze me!